Inspired by a similar look that I recently wore, this laid back, casual outfit is great for those lazy summer days that turn into nights. It's early days, but now the weather has heated up, it's always a good idea to have layers that are easy to remove when you're out and about. 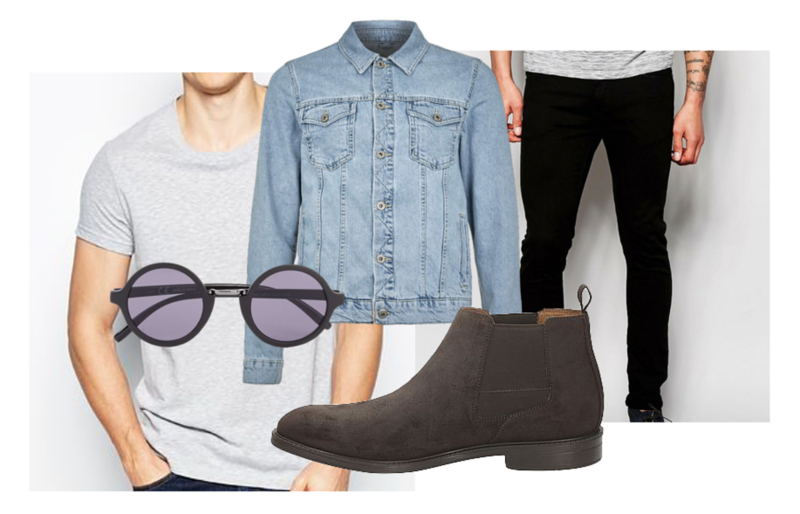 A denim jacket is the perfect piece for summer as its relatively light weight and doesn't go out of style. It's also great to throw on when the temperature drops in the evenings. The perfect shade depends on your taste, but I'd stick to lighter washes for this time of year. I'm not much a short's guy, so I always stick to a thin jean or chino in the summer. I find them a lot easier to match up and it keeps a smarter appearance than a pair of cut offs. Double denim is a no go, so stick with black jeans when you're going to complete a look with a denim jacket. A great alternative to the plain white tee is a light shade of grey. I find it has a softer appearance than a bright white option, but still keeps it classic. I also like how it matches up with a washed out denim jacket for that beachy touch. The accessories are up to you. Obviously, sunglasses are a must and these round frames add a more stylish touch than your regular square frames. The boots are a great way to add another interest point - introducing another shade and texture to the overall look.